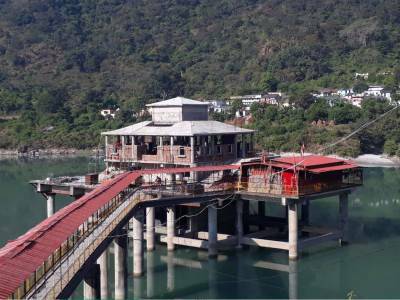 Dhari Devi Temple is very sacred and ancient temple and located on the banks of the Alaknanda river, Kalyasaur on the way to Kedarnath/Badrinath and very close to the Srinagar in Uttarakhand, according to Srimad Devi Bhagwat, Dhari Devi temple is one of the 108 shakti sthals. Temple houses the upper half of an idol of the goddess Dhari Devi, according to local lore, Dhari Devi idol changes in appearance during the day from a girl, to a woman, and then to an old lady. The idol`s lower half is located in Kalimath, where mata is prayed in Kali roop. According to the Priest, the goddess protects the four Dham (Kedarnath, Badrinath, Yamunotri and Gangotri) in Uttarakhand. The Dhari Devi is considered to be Goddess of mountains and pilgrims. 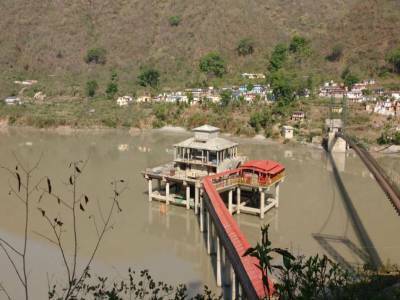 The Dhari Devi Mandir now has been raised from its original position in the middle of the river due to the construction of the Hydro Power Plant in the year of 2013. The people of Dhari devii said that 2013 Kedarnath disaster occured because of tempering of the Dhari Devi Temple. Dhari Devi Temple decorated with numerous bells and give very divine feeling. Inside the temple one can perform pooja with the help from the temple priest. Get quick answers from travelers who visit to Dhari Devi Temple.